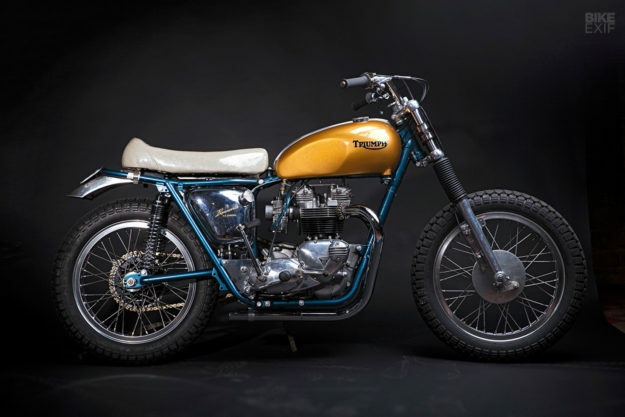 Work on motorcycles long enough, and you’ll amass two things: a pile of leftover parts, and the wisdom to know which of those parts go best together. 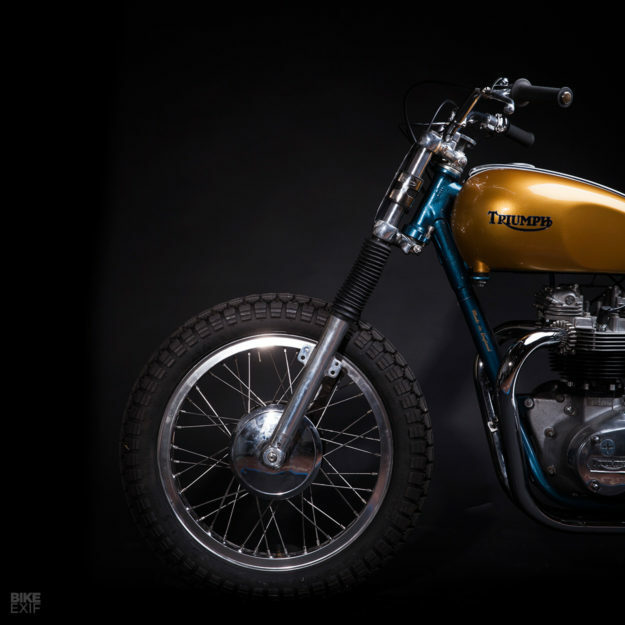 Hayden Roberts has hit that level, and this candy-coated vintage Triumph dirt tracker is the result. 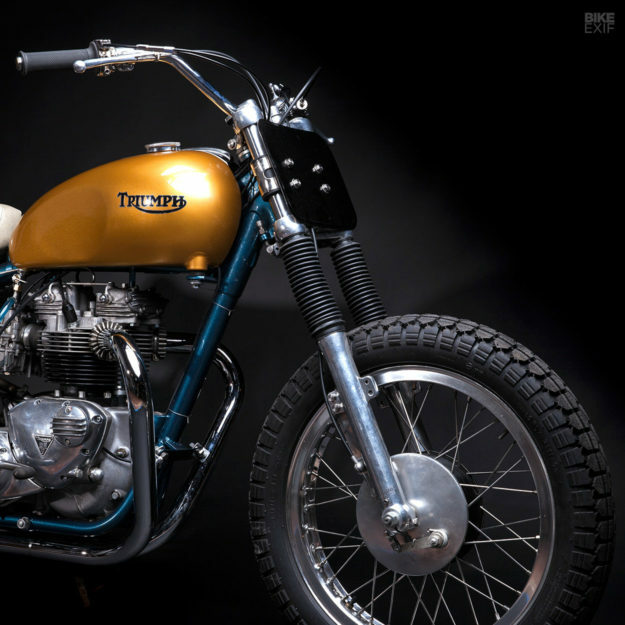 Hayden restores and repairs vintage British machines under the moniker ‘Hello Engine.’ Originally from Birmingham, England, he escaped to the Californian coast in the early 2000s; “about 40 years too late,” he says. 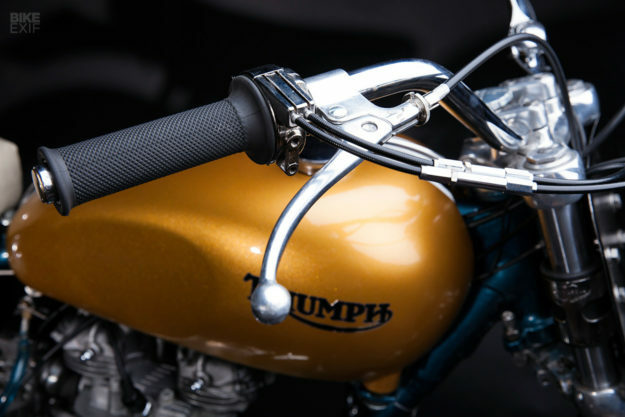 The 750 came with a left side shifter, since Triumph switched their well-known right side shifter over to the left in 1975. “But all proper bikes shift on the right,” says Hayden. He also lightened and balanced the crank, switched out the factory cams for a set of TT ones, and threw in a couple of higher compression pistons. Other upgrades include a battery-less CDI ignition and a set of Amal Mk2 carbs. The exhaust ports have also been modified: they now accept clamp-on pipes, rather than the traditional push-in types that can come loose. 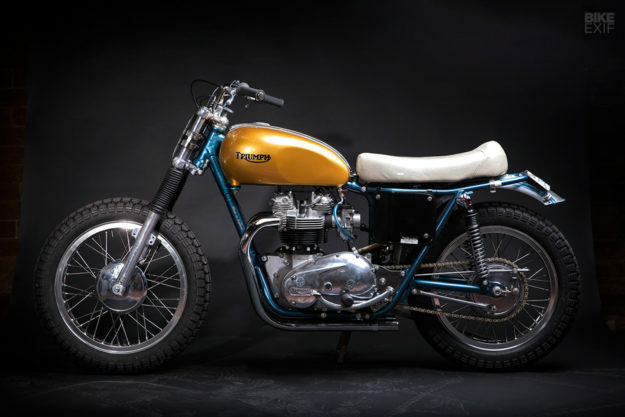 Other salvaged parts include the 1966-model slimline gas tank, the oil tank, a set of folding competition pegs and a late 60s rear drum brake. The oil tank’s been modded with an outside filler, and the pegs fitted with replacement Bates rubbers. 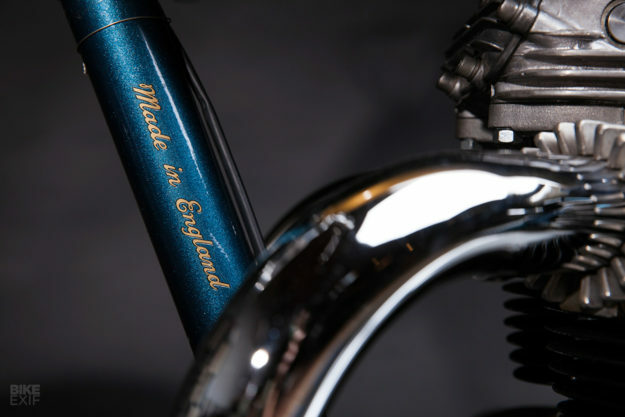 The rims are shouldered Akronts from the 70s, laced up with stainless spokes from Buchanan’s. The front drum brake hub is from a 500, which Hayden points out is a fair bit lighter than the 650 unit. “Both drums have been turned and the shoes matched, so they actually stop,” he says. 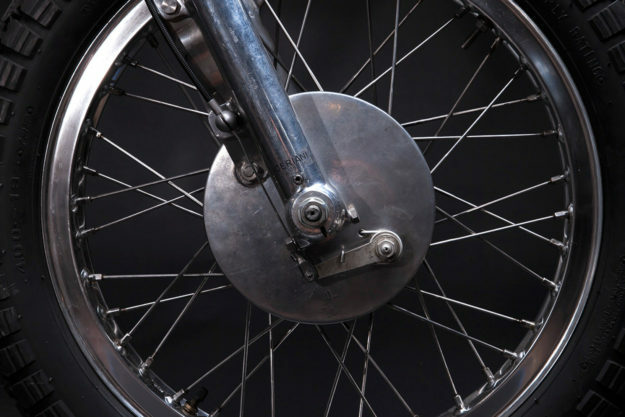 The front’s held up by a set of Ceriani forks, re-valved and sprung to match the bike’s weight. 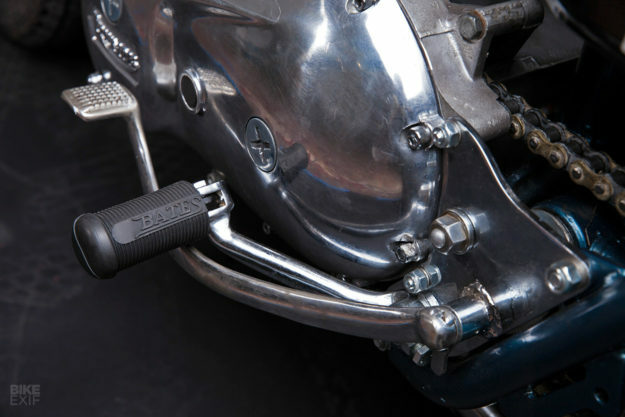 A new set of NJB shocks do duty at the rear, with an authentically basic aluminum fender capping things off. Up top are wide N.O.S. handlebars, a Tommaselli Daytona throttle, and new grips. A pair of Tommaselli headlight ears have been repurposed to hold a number board, rather than a headlight. 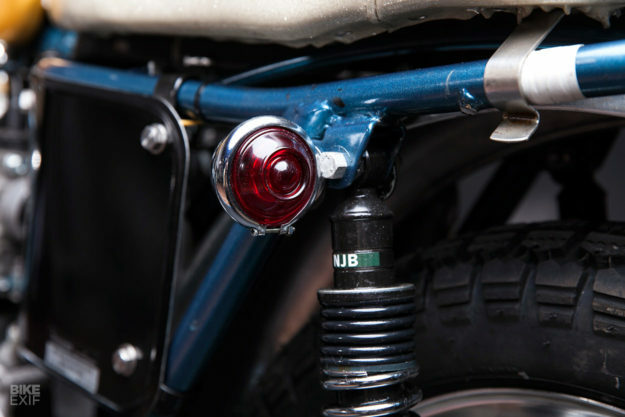 The only lighting anywhere on the bike is a small Harley marker light, mounted on the left for use as a tail light. That Bates-style seat looks like another refurbished part, but it’s not. It mimics the Bates competition seats of the 60s, but it’s been designed to match the frame’s lines better, and is better padded than the original. 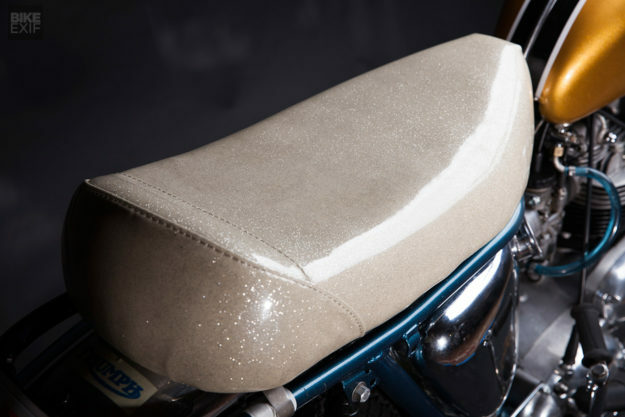 Hayden uses the same seat on all his desert sled builds, using seat pans made for him by Evan at Iron Cobras. 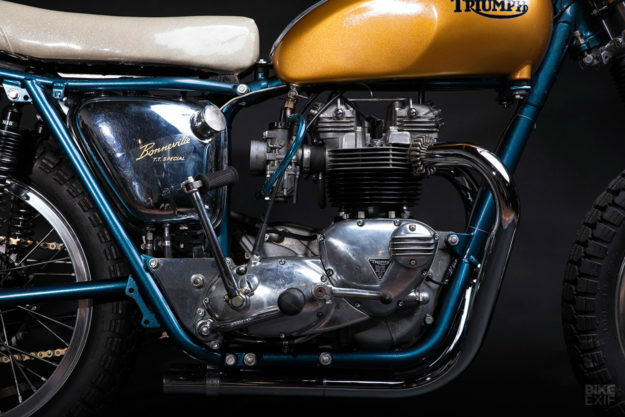 We happen to like the combination—but even if you don’t, this is one sorted vintage racer. On top of the serious diet it’s been through, Hayden reckons it’s punching out about 20 percent more horsepower. And almost all the work you see here was done in-house, including the motor rebuild, head work, wheel builds and paint. Even the heads on all the stainless steel fasteners have been turned down on a lathe to remove their manufacturer markings. “The only thing we didn’t do was polish the aluminum and paint the stripes on the top of the gas tank,” says Hayden. You could technically call Hayden’s new sled a bitsa, but that’d be unfair. 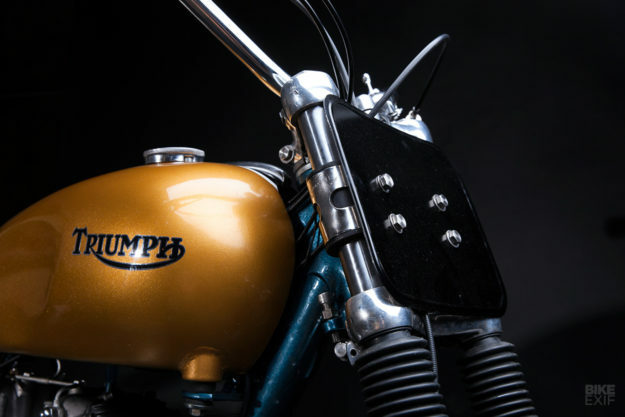 It’s a combination of Triumph’s greatest hits; a shimmering delight that makes us wish we were in California right now.